WATCHTOWER. Pine, Sitka spruce, fir, ink, painted wooden bowls, glass. 35"x15"x6"
Food constitutes our most fundamental relationship with the land, and humans have been consuming, cultivating, and harvesting corn since time immemorial. Corn has spanned the territory from sacred mythology to mindless consumption, and yet so many stories about corn are still waiting to be told. “Corn breeds its own poets, lunatics, and lovers,” noted author Betty Fussell. It is no wonder that we have alternatively prayed to, fought for, and rallied against corn; corn is everywhere, and it is intrinsically tied to the people, successes, and failures of civilizations throughout history. This exhibition traces corn from proverbial seed to silk, following the history of this extraordinary grass from ancient worship to modern ubiquity. You are invited to explore this multidisciplinary exhibition with the hope that these works offer a unique perspective on a powerful plant and its varying importance for different individuals and groups at different points in time. The exhibition delves into the human relationship with corn as experienced by several artists, activists, and farmers. Contributors to this exhibition use sculpture, photography, and the crop itself to portray an intimate glimpse into the human-corn relationship. Works by Lauren Aczon, Jenifer Bliss, Lisa Bunin, Yvonne Escalante, Victor Flores, Jim Leap, Viviana Paredes, and Liz Birnbaum will be on display. Full Belly Farm has donated organic popcorn and additional works will be contributed from a private collection and from the archives of the Ecological Farming Association. Please come and be amaized! This exhibit is a partner event for a festival of activities being coordinated by the San Jose Museum of Art that celebrates and explores the role food plays in our lives. Around the Table: food, creativity, community involves 38 Bay Area organizations are presenting projects by local farmers, artists, designers, architects, performers, and activists. For more information visit http://www.sjmusart.org/around-the-table. Since receiving his MFA from San Jose State University in 1985 Reid Winfrey has created and exhibited consistently strong bodies of work and in each new body his technical expertise and draftsmanship meld with his ideas and chosen subject matter whether that subject be the energy of the flame as in his series and solo exhibit “Playing with Fire” or his series based on the subtle quiet of his experience of the ocean (Reid is an avid surfer). The result has always been works that are at once accessible and sophisticated. While with the earlier works Reid often combined numerous techniques and materials, The Commute Paintings are created with the more “traditional” means of oil paint on canvas or wood panel and it is obvious that Reid has mastered the medium. In this series Reid has turned his gaze toward the landscape and more concisely, the landscape at night with the rivers of warmly glowing headlights and taillights flowing around and through the freeway’s canyons and ridges. The images are likely familiar to those who live or work in the Santa Clara Valley but rather than feeling the frustration that the traffic can cause here there is a quiet beauty of illumination within the darkness, rendered with depth and sensitivity that brings life to these paintings. Reid travels forty miles each way between his home in Capitola, California and his work as Professor of digital arts and animation at Cogswell Polytechnic College in Sunnyvale, California. Natalya Burd was born in 1972 in Bishkek, Kirghizia, which at the time was a Republic of the USSR. After graduation with distinction from the Kirghiz State of Art and later the Stroganov Moscow State University of Arts and Industry (Monumental Painting and Decorative and Applied Glass), she left Moscow and immigrated to the US (1996). She made her way to the Pacific Northwest where she was able to overcome the language barrier to receive a BFA from Oregon State followed by an MFA from the University of Washington in 1999. Later that same year, Ms. Burd and her husband moved to San Jose where she started a family, co-founded the Mural Project, and continued to paint and develop her extraordinary technique and powerful subject matter. 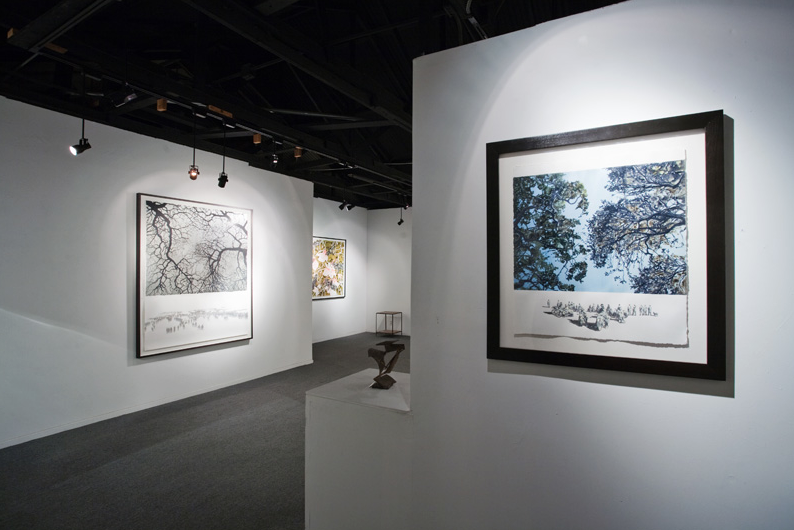 These paintings are meticulously rendered in a variety of gechniques from boldly applied opaque metallic paint, to thin, delicate washes of ink reminiscent of Sumi (Asian brush painting), on paper. Ms. Burd also cuts into the painting surface, leaving voids. These cutouts create shadow images that reinforce the reality of the physical painting itself. These are works that describe the past, the present and existential questions concerning the nature of man and the relationship of man to nature. One senses Ms. Burd's personal history in these works. A history of difficulty faced and overcome through a sensitive balance of the natural and the nature of man. This is Natalya Burd's first solo exhibition in San Jose and I am fortunate to be able to introduce her and her work to a wider audience. The landscape is the common thread that runs through these paintings, however, these three are not what one would call landscape painters. Sukey Bryan's paintings depicting the various states of water from the rapidly flowing falls and rain to the quiet falling snow and the stillness of ice. In each piece her technique, color sense, and fidelity of rendering combine to create works that move between the representational and abstract, the recognizable to simply brushstrokes. In each case, the paint is handled with confidence, economy and flair. Mila Libman also uses water as subject for her large works on paper. Her perspective is of viewing the water and the reflection of the sky across an undulating surface of a Sierra Nevada lake. These amazing works are at once descriptions of movement and of visual movement iself. They focus your attention on the changes that exist on surface and one senses the volume of water just below. These are sensitive, finely crafted, nuanced works and Mila's ability to find the colors, meld them, and reduce to the essential is beautiful in its simplicity. Tim Ryan's works are physical by virtue of the material he employs and nature of his process. His landscapes describe change and "accidental" nature of the physical environment. Tim seems to become part of this cycle of change as he lays down layer upon layer of paint, and then grinds back into the surface, exposing the previous paint layers. The history of change becomes visible. These are elemental works. They are physical but also delicate as colors peek from behind one another and lay over what went on before. It is like a lacework of color-laden cuts moving gently across the textured surface.